The project is the brainchild of social justice activist Sarah Doherty and award-winning artist/illustrator Lauren Simkin Berke (whose work has appeared in a variety of top-notch places listed here). I’ve been following Lauren’s work since we first met through Snoopy in college many years ago. Snoopy even got a first edition printing of the My Oppression Card Project last year, and I’ve gotta say, these are among my favourite conversation pieces in the house. The only thing that made me sad about our current Oppression Card package is that they are so cool, and so well done, that I didn’t ever want to use them (even though we’ve had plenty of opportunity to) as I wasn’t sure I could ever replace them. That’s why I was delighted to hear that Lauren is now soliciting funds to do a mass printing of these cards through Kickstarter starting this month with the intent of making them widely available to help people start (or end) conversations initiated by microaggressions. Donating is basically equivalent to purchasing a set of cards, and trust me, they are totally worth your money. Why? Because they are high-quality, snarky, social justice-oriented, and just plain wonderful, as a gift for yourself or someone else. The My Oppression Card Project (that I will refer to in short as TMOCP) is a first step towards using the simplest version of my skillset (drawing, design, and print production) for something that can help people other than however the experience of art helps people. The intent of TMOCP is to be an easy and beautifully designed tool to help deal with microaggressions. The text of the card was written by Sarah Doherty. I did the lettering and design. You can (and should!) 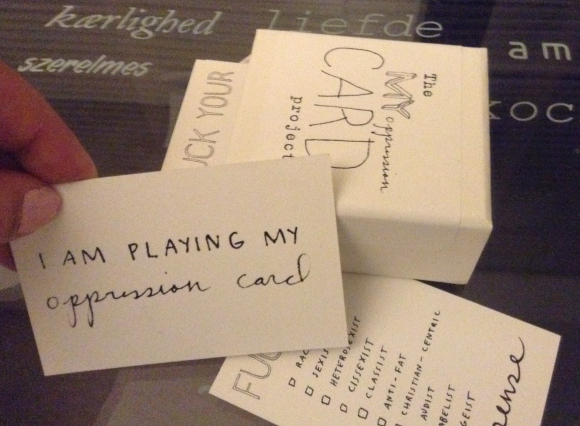 donate to The My Oppression Card Project Kickstarter here.